Being blustered expresses itself in a healthy manner. This drawing came about after another wasn’t working out. The dramatic marks display a sense of dark vacancy. 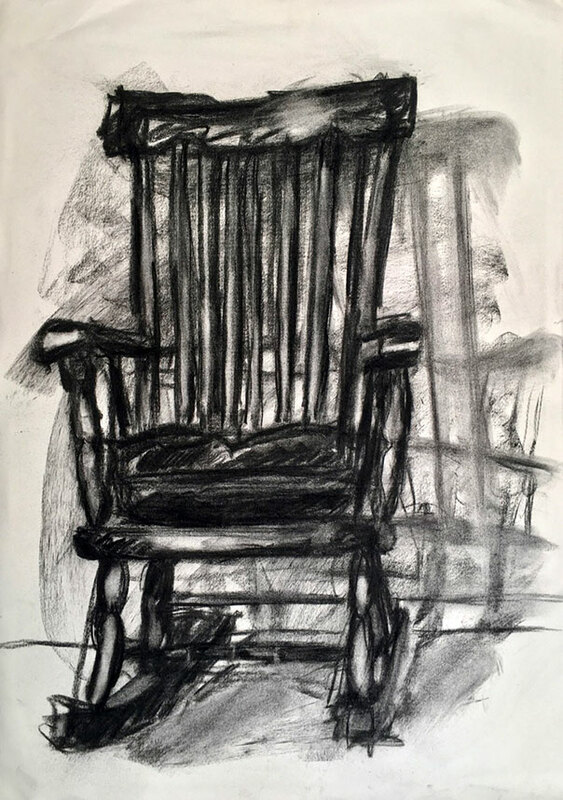 In the heat of being frustrated with another drawing, I hurriedly threw down the paper I was drawing on and cast my eye to a rocking chair my dad repaired. The chair is the classic form, everything one would think an antique chair would be.. it’s dark oak stained, with thin railings that for a surprisingly strong total piece. The cushion is nice and thick, too. I grabbed a sheet of Rives BFK I’d been saving for who knows what, and drew fast. I don’t think /I really looked at the paper the whole time, but I’m sure I must’ve. The sheet is 22” x 30” and I used standard vine and willow charcoal. This combination of paper and charcoal I’d never tried before, and have to say I prefer it. This dynamic, gesture-charged work promotes a sense of vacancy and dramatic absence, as well almost being caught in motion. 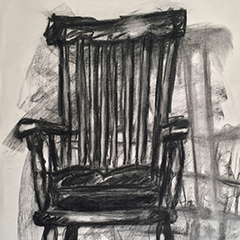 It’s been said in criticism and reviews of the piece that it either looks like I drew the chair just after someone had sat there or the chair itself is about to get up and walk away. Although I said I drew it hurriedly that’s not to say I drew it fast, It took maybe 4 hours—but a non-stop, no break, fast-paced 4 hours. I lost 4 hors of my life drawing this; 4 hour without memory, but I don’t mind.